As part of the exhibition 'Art in Translation' with the Keeley Street Set, I used van Gogh's Starry Night as inspiration for creating the collection below. This locket brooch can also be worn as a pendant and is the centre piece of the collection. I have used this piece to create simpler versions. The brooch is not for sale, but similar, or locket pendants can be made as a commission. Made from 100% recycled silver, with 0.8 mm posts. About 10mm in diameter. I also have one pair of gold plated earrings available. 18 ct 100% recycled gold versions made to orfer, with deposit. Made from 100% recycled silver with standard earring fittings. Spiral dome is about 18mm in diameter. I am exploring different versions of these earrings, so the version I make of drop earrings may well be different. Spiral dome (about 25mm diameter) either with gold leaf (as shown) or gold plated, with either yellow or blue sapphire. The bands are made with 4mm by 2mm wire. These are made using a screw thread to hold the dome and ring together. Please email me if you would like to know more. A domed spiral pendant with an opal set in it (suggesting a drop of water). It comes with a lapis lazuli bead necklace with hand forged S clasp. 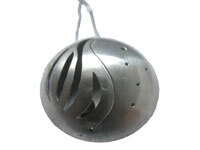 A simplified version of the brooch pendant, this is made of 100% recycled silver with a silver ball inside. Future versions of this will have a yellow sapphire set on the right handside, and gold inlay. I will also make a simple locket version of this. Comes with silver chain.